Wrestling was the third national championship sport established by the NCAA, following track & swimming. Follow these links to learn what you need to know to get your wrestler on the mat & being successful! All participated in the AAU IOF. Coach Reape is in the Wrestling Hall of Fame! CLAY defeats Oak Harbor (Ohio), NC Freaks (NC State Champs), Iowa White, Westerville United (Ohio), Rootstown Raiders (Ohio), Tallahassee Noles, Talon Wrestling (FL), Illinois Top Dawgs, Orange City (FL), and Eastwood (Ohio). RSVP by Monday to Stacee Reape 9046996295 with your total count. Tuesday March 22nd the City of Green Cove Springs will be recognizing Head Coach Jim Reape. Come on out to City Hall at 7pm to celebrate. CLAY wrestling are your 2016 STATE RUNNER UPS! 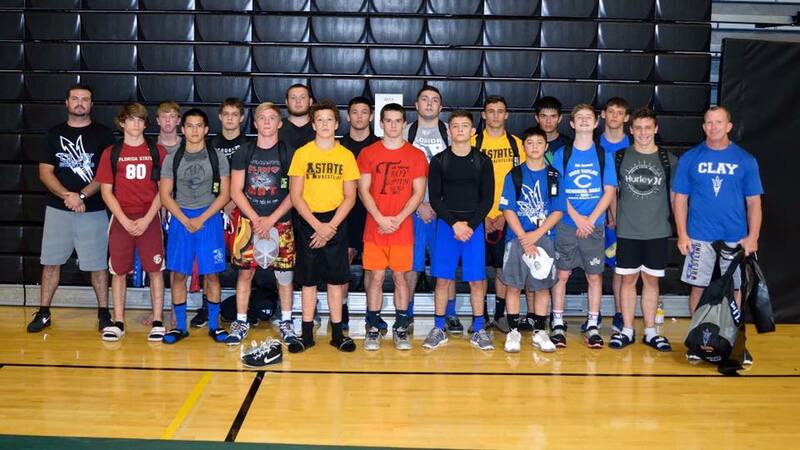 What a great weekend for the CLAY wrestling community. 12 state qualifiers. TEN state placers. 2 finalists. One State Champ. The most points score in the state tournament for a 2nd place team in the history of the state tournament. Jeremy Beaulieu and Abbott Taylor both qualified and were one match away from placing. Thank you parents helping provide food, water, and a great tailgate experience....Calvin Bramlitt, Jim and Gwen Browning, Phillip and Madeline Samec...video taping and photography-Bart Rodriguez and Roger Merring....organize tournaments-Mollie and Mike Hughes, Chris and Tara Green....food during the day for breakfast and lunch- Micheal and Terri Collins, Kelly and John Gagliardo.... Our book keeper Jennifer Weseman who makes our lives way easier...If I left anybody off i apologize. Coach Reape is in the Hall of Fame! Please join me in congratulating Coach Reape for being selected to receive the “Lifetime Service to Wrestling” award, which he will receive in August at the National Wrestling Hall of Fame in Stillwater, Oklahoma. This is an amazing accomplishment!! This is not just some simple award or plaque, but instead solidifies Coach Reape’s legacy in the sport of wrestling. If asked, I’m sure Reape would tell you he had very little in making the Clay program great, and would instead point to his wrestlers, assist coaches, Stacey, and the amazing parents/family that make up the program. But the truth be told, Jim Reape is the person that has built the Clay High Wrestling Program into the stellar program that it is today. His commitment, dedication, passion, and countless hours spent on the mat have shaped Clay High into one of the premiere programs in the State, and Southeast. Even if Reape did not have countless accolades, wins, or championships we would still go down as a Great coach, because he coaches what means the most….character. The word that stands out to me more than any other in this awesome award is…..Service. One cannot place value on the service that Reape provides for the kids at Clay High. Providing simple things such as food, rides, money, shoes, guidance, and countless other services. Great coaches are great teachers, and they are always instilling life values and character into every practice, which can be seen at any practice Reape instructs. I will finish by saying Clay High is extremely proud and lucky to have Coach Jim Reape as one of their coaches, and not because of what he has accomplished on the mat but more importantly what he has accomplished off the mat. Thank you Coach Reape for being a true pillar in our community!! Qualifying all 14 wrestlers for regionals. 13 of the 14 weight classes had District Champs from CLAY. CLAY had 13 tournament placers out of 14 weight classes. Great team effort! Gagliardo, Hughes, Browning, Miller, Summa, Sawdo, and Collins take 2nd. Congratulations to John Whiting on choosing Lindenwood University-Belleville to wrestle for this fall. John's signing will be at 9:15am this Thursday in the CLAY High Media Center. Team mates, parents, and alumni are welcome come on out. Team CLAY finishes 5th in the 2015 AAU National Scholastic Duals in Orlando. We defeated: Venice, Pasco, New England Gold, Cypress Lake, Riverdale, Dixie Hollins, Westerville Ohio, Northwest Ohio Royals, and Wakulla. VERY PROUD OF ADAM BRIENDEL WHO WAS VOTED THE TIMES UNION WRESTLER OF THE YEAR FOR THE 2ND YEAR IN A ROW. WAY TO GO ADAM!!! CONGRATULATIONS TO 2X STATE CHAMPION ADAM BRIENDEL!!! KALEB COLLINS WHO BOTH TOOK 4TH PLACE AT STATE! Browning, Summa, Breindel, Steinmetz, Whiting, Collins, Rivers, & Beaulieu. CONGRATULATIONS TO ADAM BRIENDEL FOR BEING SELECTED AS THE WRESTLER OF THE YEAR BY THE TIMES UNION. YOUR BLUE DEVIL FAMILY IS VERY PROUD OF YOUR ACCOMPLISHMENTS. 145-Breindel goes 4-2. Pinned a NC 6th state placer. Lost to CA 2 time state placer (5th & 4th). Beat VT state runner up. 170- Larson goes 1-2. Beats NC 5th state placer. Lost to GA 2 time state champ & a state runner up. 170- Sichmeller goes 0-2. Lost to NC 4th state placer in last 10 seconds of match. Then lost to MT 6th state placer & state runner. 182- Whiting goes 0-2. Lost to MO 2 time state runner up. country- including GA, SC, NC, VA, NJ, PA, NY, VT, CT, an CA. Congrats to Adam Briendel who brought home a state title for the 145 weight class!! BLUE DEVILS DEFEAT FLEMING ISLAND 30-29 WITH JON WHITING GETTING THE WINNING PIN TO SEAL THE DEAL!! GREAT JOB BLUE DEVILS! BLUE DEVILS WIN CLAY ROTARY!! Blue Devils take first place at the Gulf Holiday Duals!!! CONGRATULATIONS TO OUR VERY DESERVING COACH JIM REAPE FOR BEING CHOSEN BY THE NATIONAL WRESTLING COACHES ASSOCIATION AS COACH OF THE YEAR FOR THE STATE OF FLORIDA!! The amazing Blue Devils are State 1A Runner Up for the 3rd year in a row!! Congrats on a great year! ON THEIR 14TH CONSECUTIVE REGIONAL TITLE!! CLAY HIGH BLUE DEVILS WIN THEIR 14TH CONSECUTIVE DISTRICT WIN! SO PROUD OF OUR BOYS AND THEIR COACHES, THEY ARE THE BEST IN NORTHEAST FLORIDA! Clay over Creekside 60-6 Great job Blue Devils!! CLAY VICTORIOUS OVER FLEMING ISLAND !! FIRST PLACE AT GULF TOURNAMENT 8-0 GREAT JOB BLUE DEVILS! Clay High Blue Devils took FIRST place out of 26 schools this weekend at the Effingham Rebel Invitational in Georgia!!! Way to go guys!! On Nov 9th, some of our Clay High Wrestlers traveled over to RideOut Elementary to demonstrate new exercise and fitness routines for the elementary kids. Thanks to Coach Cambron at RideOut for having the guys over for a little extreme fitness!! WE ARE THE 2012 STATE RUNNER UPS!